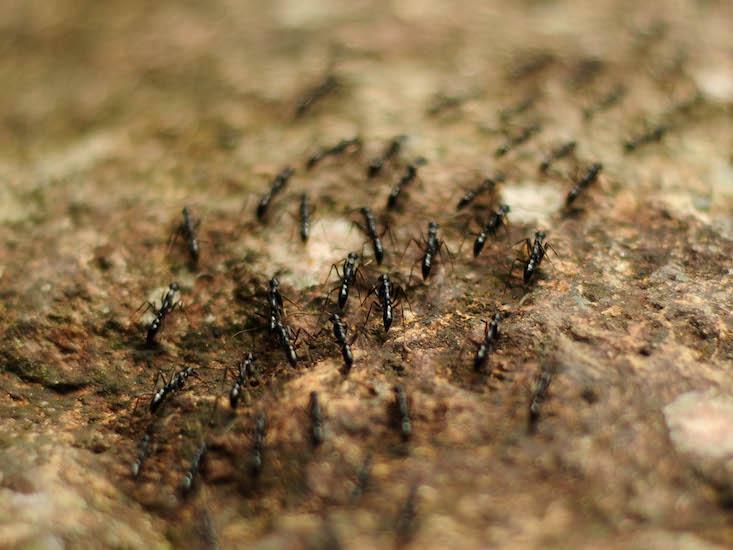 These “traces in the environment,” in a process generally referred to as “stigmergy,” help explain how simple agents, without a larger meta-ability to communicate, coordinate, or structure their transport networks, can display such “surprisingly intelligent collective behavior.” Humans are not so ruthlessly efficient—the University of Minnesota transportation researcher David Levinson found, in one study, that only 15 percent of daily commuters were on the shortest route possible. In the beginning, people lived in caves. And then they built huts when they ran short of caves. But at first there were no developed land uses other than housing. Sure, land was used, it was used for hunting and it was used for gathering. But it wasn’t much used for manufacturing. Eventually enough was gathered (and agriculture was developed) that warehouses of a sort were constructed to store foodstuffs for future use. Enough was traded, that a blanket on the ground became a table became a tent became shops (retail land uses). Places of worship moved out of the living room into a common structure, or communal fire pits were enclosed. Manufactured goods moved from the home to a workshop to a factory. Bureaucracy itself required its own spaces. The modern world was created. Sociologists talk about First space (home), Second space (work or school), and Third space (social gathering spots). Some, such as Ray Oldenberg in the the Great, Good Place, bemoan the loss of third space in the US as First space has gotten larger and larger. There is less reason (and it is costlier) to go to a pub or a coffee shop when you have your own wet bar in the basement and your houses are spread out in a low density environment. I like my house. I may have felt cooped-up in a one-room apartment in the city. Importantly, today’s large homes with information technologies are so much more entertaining, people don’t want to leave. The notion of free-range children is the exception, and this is not just because parents are overly protective [my neighbor returning my child home because he was playing standing guard outside her house across the street], but because children aren’t as bored in the home with their devices as they are outside the home without them. And when the neighbor kids stay at home, the outdoors is even less entertaining as there is no one else to play with. It is a vicious cycle with the natural end state that no one plays outside. With the internet and its billions of cat videos, plethora of video games, and any music they could want, along with instant virtual connectivity to anyone they might want to socialize with, there is no need to go out. In recent years, we have seen obsolete land uses revert back to housing. We have seen conversion of old industrial lofts to housing, transformation of offices to housing. We are adding far more housing space as a share of new development then in previous decades. Retail spaces are being abandoned and repurposed. Automation means that (a) manufacturing and warehousing have even fewer ties to the labor force than before, and so are even more footloose (to locations where the cost of robots and transportation of materials to the site and transportation to end users is lowest), (b) that transportation costs drop, and depend primarily on the value of time of the goods being moved, wear and tear on vehicles, and the costs of energy (which are falling), (c) agriculture and food production are are more like manufacturing than artisan craft-work. While manufacturing and food production will require space, they don’t necessarily require space inhabited by people. To the extent that people work, they will less and less need to work any particular place. They may need to meet with others, but that need not be at one another’s cubicle. Second space will disappear. This may result in an increase in Third space as humans, at least the extroverts among you, and even introverts in extrovert mode, still want some face-to-face interaction. But what is to say that won’t occur in people’s large large homes? In a world with authenticated people identifiable from facial recognition by your smart home and with established identities and reputations, the threat of inviting “a stranger” into your home, or the public portion of your home may no longer be so frightening, as no one is really a stranger anymore. The greater threat will be meeting someone in a public place where you don’t control the environment. In the end, just like the in the beginning, the only built structures people require is housing. Second space will diminish. Third space may or may not fill the gap.